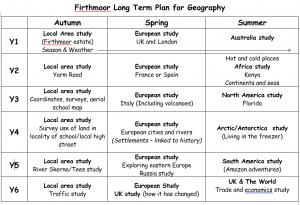 At Firthmoor Primary School, Geography is taught following objectives from the National Curriculum framework and is covered through either blocked or weekly lessons. Throughout our topics, children are encouraged to learn about diverse places, people, natural and human environments whilst developing a deeper understanding of the Earth’s key physical and human features. Children are tasked with answering geographical questions but we also encourage children to ask questions themselves and debate the relevant associated issues. We aim to instill in our pupils a curiosity and fascination about the world and its people. Children are encouraged to share their ideas through a range of formats, including maps skills (creating and using), collecting evidence and fieldwork skills and writing. We also aim to incorporate current topical incidents into our Geography lessons to deal with the ‘here and now’ of real life, and that it is a ‘living’ subject that contributes to and enhances the children’s knowledge of Geography. Children have the opportunity to take part in various educational visits linked to Geography. Classes have enjoyed and developed their geography skills at various locations such as Saltburn, Whitby and Teesmouth. 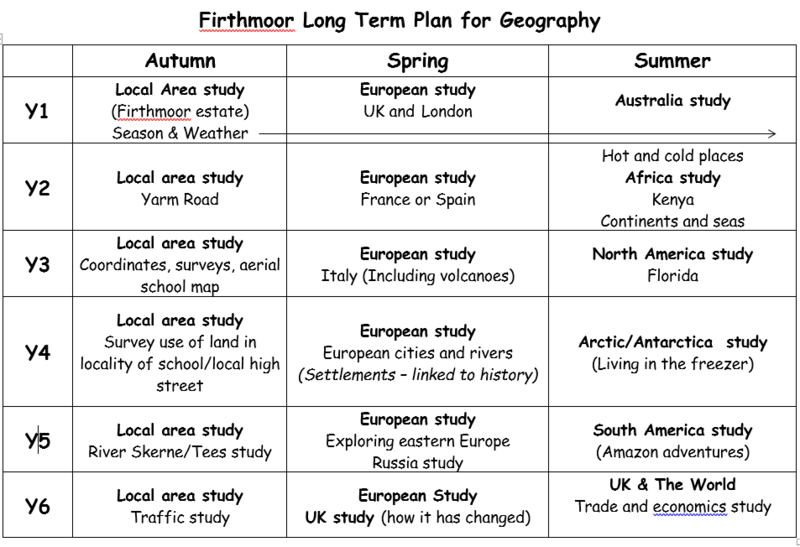 Children have access to a number of Geography texts to further their knowledge about the world in which they live, and daily Topic Text sessions are often linked to the Geography topics being covered.